Both the San Clemente and Trabuco Hills offenses showed no signs of slowing down in the fourth quarter Thursday night at Thalassa Stadium. The two Sea View League opponents battled back and forth all night, with the Sea View League title on the line, and it was only a matter of time until one defense made a stand. Trabuco Hills trailed by seven with just minutes to go and, after recovering a San Clemente fumble, drove down to the Tritons 5-yard line. Facing a fourth and goal, Mustangs senior quarterback Jimmy Jacobs hit his go-to target, senior receiver Jacob Breeland, on a slant route. But San Clemente defensive back Andrew Frohner sniffed it out, stopping Breeland one yard short of pay dirt, forcing a turnover and ensuring the Tritons held on for a 42-35 victory. The win earned the Tritons (8-1, 3-0 league) at least a share of the league title for the first time since 1999. 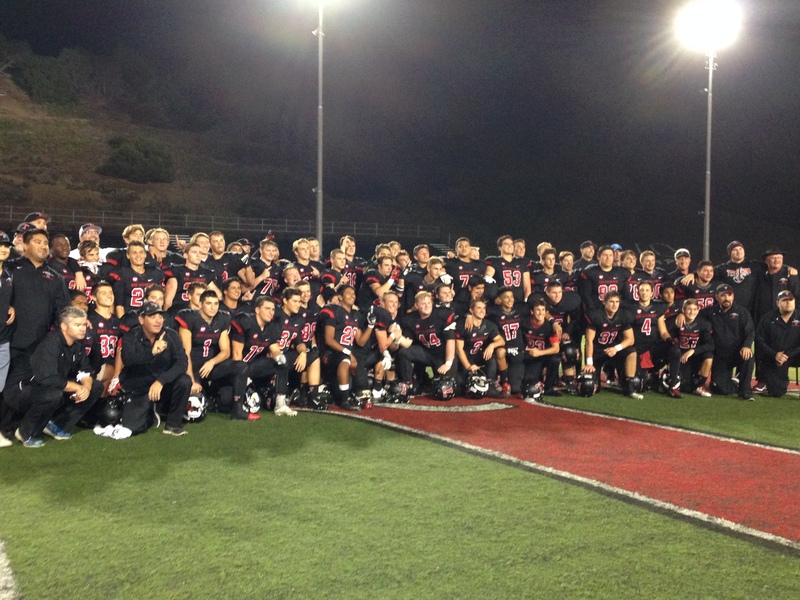 San Clemente has one game remaining on the schedule, a Nov. 7 tilt against Aliso Niguel. If the Tritons can defeat the Wolverines they will earn the league title outright. Frohner also made what was, at the time, the biggest defensive play of the night four minutes earlier. Jacobs heaved a 31-yard pass to Breeland in the endzone and both he and Frohner came down with the ball. The play was ruled a touchdown, which would have tied the game up at 42-42, but after a lengthy meeting between officials, the call was overturned and ruled an interception-touchback. Both offenses were firing on all cylinders for most of the night. San Clemente senior quarterback Sam Darnold started off the scoring six minutes in with a 29-yard touchdown run that saw him break two tackles. The Mustangs (5-4, 2-1) Noah Thompson scored the first of his three touchdowns on the night less than two minutes later. With the score tied at 14-14, Tritons senior linebacker Riley Whimpey blocked a Mustangs punt, which was recovered by Gerardo Gomez to give San Clemente the ball at the Trabuco Hills 18-yard line. Sophomore running back Brandon Reaves scored on a one-yard burst to take a 21-14 lead. But Jacobs and the Mustangs offense responded, scoring on a three-yard pass play to Thompson with just 27 seconds left on the clock to take the tie game to halftime. Jacobs completed 22 of 36 passes for 319 yards and three touchdowns. Breeland had a game-high 12 catches for 197 yards. In the third, San Clemente linebacker Liam Mills forced Jacob’s to make an awkward throw and it fell to Nathan Runolfson for an interception. Reaves broke off a 46-yard touchdown run four plays later to give San Clemente a 42-28 lead. Reaves finished the night with 70 yards rushing and two touchdowns. He also caught five passes for 44 yards and a score. Junior Vlad Dzhabiyev rushed for 183 yards and and one touchdown and Darnold rushed for 62 and a touchdown. Darnold completed 15 of 19 passes for 171 yards and two touchdowns. I think you mean Thursday night. Tonight is Friday night.